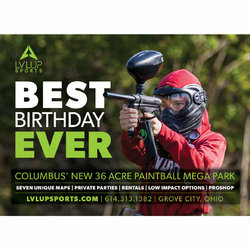 Enjoy 50% off and get $60 worth of incredible paintball action for just $30 to the all new paintball mega park, LVL UP Sports in Grove City! 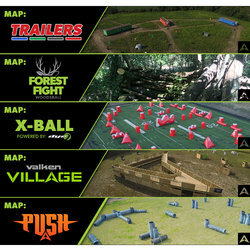 With seven gigantic maps spread across 36 acres, LVL UP is quickly becoming one of the top paintball parks in the state of Ohio. $30 gets you two of LVL UP's "Value Packages" which come with all day admission, rental paintball equipment and safety gear for the day, and 200 paintballs per person. More paintballs, upgrades and additional gear can be purchased if necessary. These packages come with everything you need to play paintball games. Packages are for Open Play. No reservation required, valid only on Saturdays or Sundays (check website for hours). Voucher is for traditional paintball open play only. Please check website for open play hours, no reservation required. Low Impact options not available with this deal but are available through the LVL UP website. Not valid towards private groups.